This article focuses on egg symbolism in mythology and highlights and identifies sources of egg myths and symbolism close to Japan. Egg symbolism and myths appear in a number of ancient civilizations, apparently emerging out of Southern Africa over 60,000 years ago (see “Ostrich Eggs Used in Stone Age Communication“, Discover News, Mar 2, 2010 . In the ancient world, ostrich eggs were placed in the tombs and graves, especially those of rulers and children. They appear to symbolize the hope of resurrection or immortality. Because of Earth’s precession of the equinoxes it is not possible to know exactly what ancient planispheres symbolize, but there are points in Earth’s seasons that are more or less fixed. They fall at different times given one’s location on Earth. For example, the Winter Solstice occurs on December 21 or 22 in the Northern Hemisphere, and June 20 or 21 in the Southern Hemisphere. As the Afro-Asiatics (who gave us the Bible) would have been most familiar with the cycle of the Northern Hemisphere, that will be the subject of this analysis. The ancient Afro-Asiatics observed the Spring Equinox (March 21-22), the Summer Solstice (June 21-22), the Autumnal Equinox (Sept. 21-22), the Winter Solstice (Dec. 21-22). From the Winter Solstice, the hours of daylight lengthen again and the Sun is shown to be Sol Invictus (“the undefeated Sun”). In 12-division zodiacs, this is symbolized by the ostrich which hides its head for a time by lying flat against the ground, and after the Winter Solstice it begins laying its eggs. Mircea Eliade has shown that ancient cosmological symbolism involves cycles. Time was regenerated and the cosmogony was repeated on the Winter Solstice, so January (Janus) looks to the past and to the future. The ostrich symbolism is again appropriate. The wild ostrich originated in Africa where this creature produces 90% of its eggs between January and March. In the Church, the egg is both a symbol of new life and the symbol of Christ’s resurrection. This is why eggs are decorated and distributed at Pascha/Easter. The association of new life or rebirth with the ostrich egg has been verified by archeaological finds. Painted or incised ostrich eggs have been found in El-Badari and ancient Kush (Nubia). In the Oriental Museum there are examples of ostrich eggs which have been decorated over their entire surfaces. The largest concentration of ostrich eggs to be discovered in one place in Predynastic Egypt were found at a tomb in Hierakonpolis (Nekhen). In Kush ostrich eggs have been found in the burials of children. In Egypt, ostrich eggs were placed in the graves of the wealthy. At Naqada, a decorated ostrich egg replaced the owner’s missing head. This egg is now in the Ashmolean Museum in Oxford. So where does the ostrich fit among the signs of the Lion (the Summer Solstice), the Bull (the Autumnal Equinox), the Man who was called “Father of Fathers” (the Winter Solstice), and the Eagle or Vulture (the Spring Equinox)? In ancient Egyptian art, the ostrich feather represented fecundity and new life. As early as 2600 B.C., the ostrich was associated with the goddess Ma’at, who is shown with an ostrich feather in her headband. Ma’at weighed the hearts of the dead in her scales to determine who would die the “second death” (Rev. 2:11) and who would enter eternal life. So the ostrich comes after the Bull, and this is verified by the book of Job. 3% of male graves; 2% of female g raves and 1% of children’s graves at a Kish cemetery (Mesopotamia), had ostrich eggs as grave goods. Mesopotamian ostrich eggs were usually unpainted, but a rare painted egg was found from a mid–later 3,000 B.C. grave at Susa. After the 2nd millenium, ostrich eggs were found from the Zagros, through the Levant to the western Mediterranean (Source: Ancient Mesopotamian Materials and Industries: The Archaeological Evidence, by Peter Roger Stuart Moore, p. 128). In Sumer, the earliest eggs were found at the royal tombs of Ur, a widespread practice during the 3rd millenium B.C. (source: “Treasures from the Royal Tombs of Ur” by Richard L. Zettler, Lee Horne, Donald P. Hansen, Holly Pittma, p. 70). Ostrich eggs were traded by Abraham’s Kushite ancestors, some of whom were rulers in Kerma, between the third and fourth cataracts on the Upper Nile. These Kushite rulers, such as Nimrod (son of Kush), one of Abraham’s most famous ancestors, established trade routes that connected the interior of Africa to Egypt and the islands of the eastern Mediterranean Sea and beyond. They traded exotic hardwoods, animals and their skins, ivory, ostrich eggs and ostrich feathers. “Through the wealth built up by this exchange of goods, the Nubians of Kerma became exceedingly rich…..” (The Nubians by R.S.Bianchi) Those who built cities in southern India were called “Sudra”, which means Sudanese. Of particular interest, the ostrich rhyta from Mycenae in Greece and Akkadian cemetery in Kish, Mesopotamia, seen in the above report are nearly identical in shape and appearance to Japanese amphora-like pottery and especially the well-known burial urns of the Jomon period, although the latter are not made of ostrich egg shell but of earthenware (possibly in symbolic imitation). The ostrich was first discovered for the Chinese by the renowned general Chang K’ien during his memorable mission to the nations of the west (138-126 B.C.) . He returned to China with the report that in the countries west of Parthia there were “great birds with eggs of the size of a pottery jar.” The “great bird” is the common name of the ostrich among all early Greek writers, while the name “camel-sparrow” or “camel- bird” is found at a later time in Diodorus and Strabo. mention ostrich eggs as products of Persia, and describe the bird as being shaped like a camel, equipped with two wings, able to fly, but incapable of rising high, subsisting on grass and flesh, also able to swallow fire. Another account says quite correctly that the birds eat barley. When an attempt was made in Algeria to domesticate them, it was found that they thrive well on barley, fresh grass, cabbage, leaves of the cactus or Barbary leaves chopped fine ; and three pounds of barley a day was recommended for each bird, green food according to circumstances. They were then called “camel birds,” in accordance with the Greek, Arabic, and Persian designations. ince there are beautiful, naturalistic representations of ostriches carved in high relief in stone (Plates VI-VII and Fig. 8). The two sculptured slabs shown in the Plates were erected on the tomb of the emperor Kao Tsung, who died in A.D. 683; the one in Fig. 8 was placed on the tomb of the emperor Jui Tsung, who died in a.d. 712. The artists of the period doubtless received an imperial command to portray the ostriches of the imperial park in commemoration of the vast expansion of the empire over Central Asia during that epoch. CHINESE STONE SCULPTURE OF OSTRICH ON THE TOMB OF THE EMPEROR KAO TSUNQ (?. 30). T’ANQ PERIOD. SEVENTH CENTURY A.D. The Ostrich Among the Chinese 81 to turn its head completely around, a characteristic skilfully brought to life in stone by the unknown Chinese sculptor (Fig. 8). For comparison the sketch of an ostrich by Albrecht Dtirer is reproduced in Plate VIII. It is dated 1508 with the addition of the monogram A. D. It is supposed that during his stay in Venice the artist may Chinese Stone Sculpture of Ostrich from the Tomb of the Emperor Jui Tsung. have had occasion to view a live ostrich. His sketch is better than that of his contemporary, the naturalist C. Gesner, who had evidently never seen the bird. In the museum of Nuremberg there is a painting of Wohl- gemut representing the adoration of the Three Magi ; the Moor offers an ostrich egg filled with spices and bordered with gold or silver. The initials A.D. on the egg possibly refer to Diirer, and may hint at his collaboration. When, during the middle ages, the Chinese became slightly acquainted with the east coast of Africa, they learned also that the ostrich was at home in the Somali country. Then they styled it “camel crane,” and compared its eggs not unfittingly with a coconut. They even report that the natives of Africa heat copper or iron red and give it to the birds to eat ; if the eggs are broken, they give a ring like pottery vessels. In the fifteenth century, under the Ming, ostriches are reported also from Aden and Hormuz. Chinese creation myths explain the legendary beginnings of the universe, earth, and life. Early Chinese texts recorded fragments of creation stories. The Zhuangzi and Huainanzi cosmogonically mention Hundun. The Shujing and Guoyu describe the separation of Heaven and Earth during the legendary era of Zhuanxu. The Huainanzi and Chuci say that Nüwa created the first humans from yellow clay and repaired the fallen pillars of Heaven (cf. Axis mundi). One of the most popular creation myth in Chinese mythology describes Pangu 盤古 separating the world egg-like Hundun 混沌 “primordial chaos” into Heaven and Earth. However, none of the ancient Chinese classics mentions the Pangu myth, which was first recorded in the (3rd century CE) Sanwu Liji 三五歴記 “Record of Cycles in Threes and Fives”, written by Three Kingdoms period Daoist author Xu Zheng. Derk Bodde paraphrases. Derk Bodde, believed the Pangu myth “to be of non-Chinese origin” (Bodde 1961:383) and linked it to the ancestral mythologies of the peoples such as Miao people and Yao people in southern China. Professor Qin Naichang, head of the Guangxi Institute for Nationality Studies proposes the myth originated in Laibin city, Guangxi, in the center of the Pearl River Valley. He suggested that Pangu myth from this region originally involved two people. 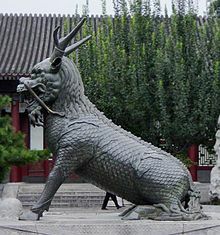 He also suggests that this mythology of Pangu had come from India, Egypt, or Babylon. The (ca. 4th century BCE) Daodejing suggests a less mythical Chinese cosmogony and has some of the earliest allusions to creation. Later Daoists interpreted this sequence to mean the Dao “Way”, formless Wuji “Without Ultimate”, unitary Taiji “Great Ultimate”, and binary yin and yang or Heaven and Earth. The (ca. 4th-3rd centuries BCE) Taiyi Shengshui “Great One gave birth to water”, a Daoist text recently excavated in the Guodian Chu Slips, offers an alternate creation myth, but analysis remains uncertain. The (ca. 120 CE) Lingxian 靈憲, by the polymath Zhang Heng, thoroughly accounts for the creation of Heaven and Earth. The Neo-Confucianist philosopher Zhou Dunyi provided a multifaceted cosmology in his Taiji tushuo 太極圖說 “Diagram Explaining the Supreme Ultimate”, which integrated the Yijing with Daoism and Chinese Buddhism. Bodde, Derk. 1961. “Myths of Ancient China”, in Mythologies of the Ancient World, ed. by Samuel Noah Kramer, pp. 367–408. Anchor. Cullen, Christopher. 2008. “Cosmogony: Overview”, in The Encyclopedia of Taoism, ed. by Fabrizio Pregadio, pp. 47–8. Routledge. Mair, Victor H. (1990). Tao Te Ching: The Classic Book of Integrity and the Way, by Lao Tzu. Bantam Books. Major, John S. 1978. “Myth, Cosmogony, and the Origins of Chinese Science,” Journal of Chinese Philosophy 5:1-20. Werner, E.T.C. 1922. Cosmogony – P’an Ku and the Creation Myth, in Myths and Legends of China, pp. 76–92. Harrap. Chinese creation myths (Crystalinks) has several versions of the Pangu myth including a dog-man version, and a version that reminds us of the Norse giant holding up the skies. The dog version resembles a myth from India about dog vs horse trampling the clay human creations. Chinese Mythology Clarified by Miao Legend Confirms Noah’s Flood History! …the Chinese legend tells how the world was swept by a Great Flood, and only Fu Xi and his sister NüWa survived. They then retired to Kunlun Mountain where they prayed for a sign from the Emperor of Heaven. The divine being approved their union and the siblings set about to procreate the human race all over again. It was told of them that in order to speed up the natural procreation of humans, Fu Xi and Nüwa found an additional way by using clay to create human figures, and with divine power entrusted to them, they made these figures come alive. Other versions of the story describe Nüwa going up to heaven and filling the gap with her body (half human half serpent) and thus stopping the flood. 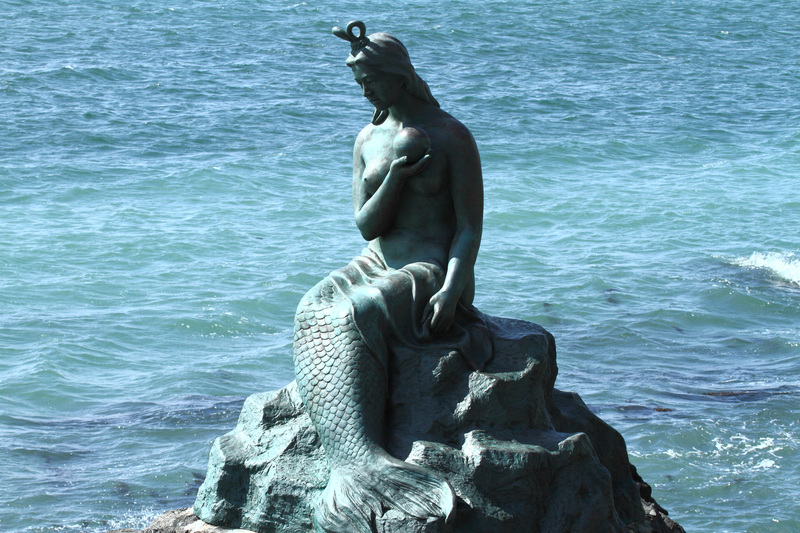 According to this legend some of the minorities in South-Western China hail Nüwa as their goddess and some festivals such as the ‘Water-Splashing Festival’ are in part a tribute to her sacrifices. * Noah’s ark landed approximately 300 meters from the huge limestone cliff face of what later would be called “The Wall of Heaven” in the famous Akkadian story “The Epic of Gilgamesh.” In this Epic, the hero Gilgamesh is en route to Utnapishtim, [Sumerian name of Noah] the one mortal to achieve immortality, that Gilgamesh comes to Mashu “the great mountain, which guards the rising and setting sun. Its twin peaks are as high as the wall of heaven and its roots reach down to the underworld. At its gate the Scorpions stand guard, half man and half dragon; their glory is terrifying; their stare strikes death into men, their shining halo sweeps the mountains that guard the rising sun”. It could be that the earliest Chinese were familiar with the Epic of Gilgamesh, before the confusion of languages at Babel, and perhaps borrowed its symbolisms. It could be that the earliest Chinese were familiar with the Epic of Gilgamesh, before the confusion of languages at Babel, and perhaps borrowed its symbolisms….the Miao Zu are another early nation who remember some of their earliest patriarchs. Not only that, but they also possess a surprisingly accurate recollections of the Creation, the Flood, and even of the Tower of Babel and its confusion of languages! Many of the finer details of their accounts coincide almost identically with the Biblical record in Moses’ Book of Genesis….The oral traditions in which the descent of the Miautso has been preserved, owe their purity to the fact that they have been recited faithfully and in full at funerals, weddings, and other public occasions since time immemorial. Thus they are able to reproduce the earliest names of their primogenitors. Noah, who survived the Great worldwide Flood, had three sons called Ham, Shem and Jafeth. In the Miao record, Nu Ah had also three sons, called Lo Han, Lo Shen, and Lo Ya Phu. Again virtually identical, with Lo meaning something similar to “Lao” in Chinese, meaning “old” or “venerable one!” Like Lao Zi, the famous father of Taoism. Even the children of these three sons of Noah are similar. According to Genesis, Ham had Cush and Mizraim, Shem had Elam and Asshur, and Jafeth had Gomer! It is said that when a great flood took place that the heaven collapsed, and the earth was sunken under water, and wild beasts cruelly killed common people, Nü-Wa repaired the heaven with five or seven colored rocks and killed the brutal beasts. Does any of this have relevance for the Japanese heritage? We know that the Miao tribes share genetic ancestry with the Japanese (mtDNA M7 and derived subclades, and Y-DNA, O and O3a5 haplogroups) since the tribes split at an early stage from a common ancestral branch along with the Qiangic, Sino-Tibetans. Common mythical motifs such as turtle symbolism, cosmic pillar-sacred tree as axis mundi, reaching to the heavens and to the netherworld, cosmic egg, primordial pair and separation of waters at the creation, as well as the prevalent veneration of sacred trees, rock/stones and idea of sky as heavenly vault …the fashioning of Jomon human clay figurines, water-splashing festivals … might be examined for possible common origins or histories. For a comparison with Japanese creation myths, refer to Sacred Text’s Kojiki or this page “In His Own Image” for an abridged version.